Argentina’s coast guard encountered a Chinese trawler illegally fishing in its territorial waters in mid-March. The Chinese poachers ignored radio calls and repeated warning fire, and tried ramming the Argentine ship. Finally, the Argentine coast guard did what few nations dare. According to the New York Post, they fired shots at the boat’s hull. They rescued four of the crew members from the sinking ship, while the rest of the 28-member crew was picked up by another nearby Chinese fishing boat. The Chinese regime has expressed outrage at the incident, but Argentina didn’t back down, and by doing so, it may set a precedent that other nations can turn to when facing Chinese belligerence in maritime disputes. Indonesia soon followed with a hard-line approach to Chinese aggression. Indonesian authorities arrested a Chinese fisherman on March 19 in the Natuna Sea, near Indonesia’s Natuna Islands, and had the Chinese fishing boat in tow. A Chinese coast guard ship then rammed the fishing boat in tow, freeing it from the Indonesian ship, according to The Jakarta Post. It’s not unusual for Indonesian authorities to arrest foreign fishermen for poaching in its waters, but the Chinese coast guard’s interfering with an arrest pushed them over the line. Indonesian authorities brushed off Chinese accusations over the incident, and on March 21, Maritime Affairs and Fisheries Minister Susi Pudjiastuti announced that her office would summon the Chinese ambassador to Indonesia and demand an explanation. The Chinese regime may have inadvertently drawn Indonesia into the South China Sea conflict, which it had little interest in prior to the incident—and the response was swift. A few days later, Indonesia announced it would deploy air defense systems to the Natuna Islands, along with four special units to man the German-made Oerlikon Skyshield air defense system, according to IHS Jane’s. After the initial incident between China and Indonesia, Vietnam also joined in. On March 31, Vietnam’s coast guard seized a Chinese refueling ship for illegally entering its territorial waters. 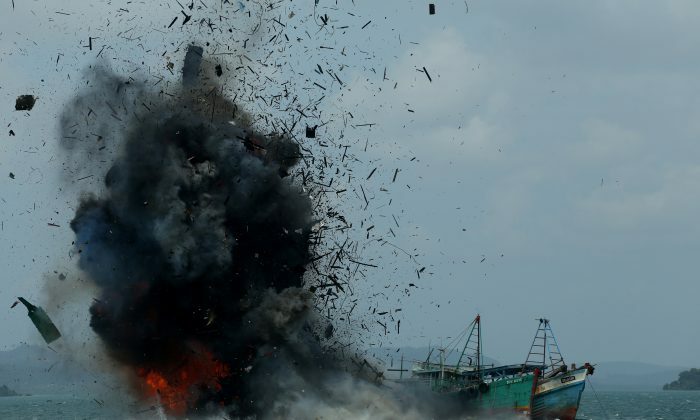 As Nikkei reported on April 3, the incident was “a rare move for Vietnamese authorities against a Chinese vessel.” The Chinese ship’s captain allegedly admitted his intrusion, and said his ship was carrying fuel for Chinese fishing boats operating in Vietnamese territory. While it can’t be said for sure that one incident inspired the others, the timing lines up, and the incident with Vietnam, in particular, showed a new level of boldness while standing up against China’s incursions. If a new zero tolerance approach really has developed among countries fighting back against China, it may bring an effective end to the current Chinese strategy for seizing territory in the South China Sea. The Chinese Communist Party (CCP) has two strategies for taking over the South China Sea—one designed around propaganda, and the other around military maneuvers. On the propaganda side, the CCP is using what it calls the “Three Warfares.” These are legal warfare, psychological warfare, and media warfare. It basically means that the regime accuses others of aggression and continues to repeat lines that it has legal rights to conquer the region. As part of the strategy, first the CCP sends in fishing boats, then buoys marking fishing territory, then coast guard ships to protect the fishing boats, then infrastructure to support the operations, and then the CCP forms a defensive perimeter to keep out foreign ships. The strategy is designed to play out gradually, while appearing as benign as possible. It’s similar to the frog in boiling water analogy, where the water heats too gradually for the frog to notice—until it’s too late. These strategies work well against countries that closely adhere to international laws and avoid drastic actions, but both have key flaws built into them. The CCP’s propaganda tactic protects and tries to validate its maritime strategy. If the propaganda systems fails, then the maritime side loses its mask of legitimacy and just looks like one country invading another’s territory. China’s propaganda systems can usually keep up, but they’ve only worked effectively when there are only a few incidents to respond to, and when its adversaries don’t react too aggressively or don’t fire back too hard against its propaganda. The real irony with the CCP’s attempted takeover of the South China Sea is that it inadvertently caused other nations in the region—even many that historically haven’t gotten along—to form an alliance against China. The recent incidents have raised the bar to a level where China’s strategies may not be able to hold up. Its adversaries are no longer playing the soft game, and if China wants to keep pushing, the stakes may soon be too high.